Music, Grapes and a Celtic Cloaking Device. in turn fermented into wine producing spirits. The cane it creates tells stories all of their own. 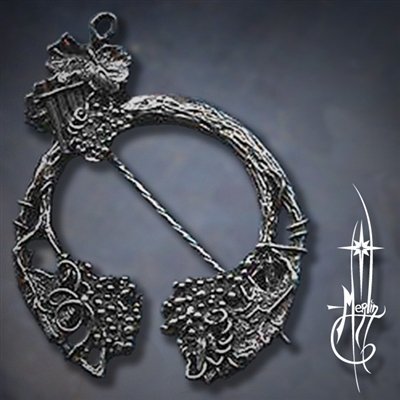 The Penannular is a brooch used by the Celts in traditional garb. It was incorporated as a fastener for fabric: from light scarf to heavy cloak. the ring securing the pin. is fastened to the frame. hold and release the fabric. the Penannular is a brooch that stands out from the more common pin. The Pan Pipe is unusual for a Penannular because of the design. The pin head itself is the pan pipe with still more leaves and grapes. this is both a work of art and a fully functional Penannular brooch. a short video demonstration of how to use a Penannular for your cloak, jacket or cape.